Fun and functional! The Doctor Who Dalek Whiz Remote Control Dalek Watch is specifically for fans of the Doctor Who sci-fi TV series. 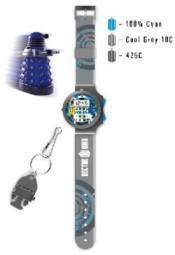 It's a totally awesome LCD watch with a blue-Dalek design that comes with an attached miniature remote-control blue Dalek that you control with the watch! It's a heck of a fun product for Doctor Who enthusiasts. The watch requires 3x "A76/LR44" batteries, included. A spare set of 4x "A76/LR44" batteries are included. Ages 5 and up.